As a log home owner, it is important for you to be aware of the process and products needed for your log home care or log cabin care. Our staff and crew at 888-LOG-GUYS can give you answers to your log home care questions. We specialize in restoring log homes, repairing log homes, chinking and caulking log homes, improving log homes, and maintaining log homes. We are currently serving the Land Between the Lakes KY area, so please either call us or ask for a free estimate from our website! 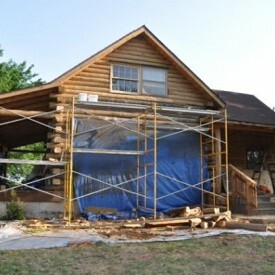 Ask 888-LOG-GUYS about a log home restoration estimate if you know it has been several years since your log home or log cabin has been treated! Your log home may need services you had not expected. In our restoration process, we use media blasting (corn cob, glass, sand, and walnut), sanding, cleaning with a borate treatment, chinking or caulking, and using the best stain products for the final touch. We offer a variety of packages that will work with your home and your budget! For a free quote, call us or send us an estimate request through our website! Are your logs getting soft or do they have holes? Are your logs poking out in odd places? Have your logs shifted on the foundation? 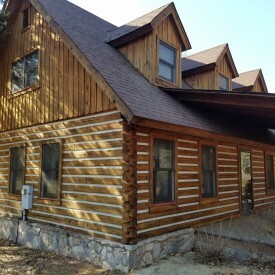 888-LOG-GUYS can fix your log home or log cabin to its best condition. Our professional crew has repaired or replaced many feet of logs, even whole walls! Please don’t wait if you think your logs need to be repaired! Contact us for a free estimate! We would love to serve you in the Land Between the Lakes KY area! That white stuff in between your logs is not just a decoration. It has a very important purpose in keeping air drafts, water leaks, and unwanted insects out of your home. If you need an energy seal, chinking, or caulking (or if you need your energy seal, chinking, or caulking repaired or replaced), please ask 888-LOG-GUYS to do the job! Your satisfaction is guaranteed when you trust 888-LOG-GUYS to your log home care needs! We do offer (on a limited basis) log home construction services. We also offer building additions to your log home that you may have been wanting for awhile. Our carpentry services include deck and porch building to log staircase construction and log railing construction. We want to help you increase your log home’s value! Call 888-LOG-GUYS today or request an estimate online! Our services reach the Land Between the Lakes Kentucky area, and our staff is ready to assist you! 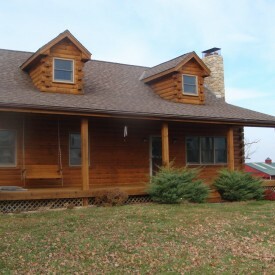 We know how much you love your log home or log cabin. Once you establish 888-LOG-GUYS as your log home care specialists, you will be assured that your log home or log cabin is in the best hands. Whether we have serviced your log home before or if you are a new client, you can be sure that our staff will keep an eye on the upkeep of your log home. We will properly maintain your log home with our best products, saving you time and money. Ask for an estimate from our website today, or give us a call to talk with our friendly staff!